Google pushed an update out to Google Search today, which includes new Google Now goodies for Jelly Bean users. The update adds an option to manually sticky your favorite sports team’s card right to your feed for live updates. 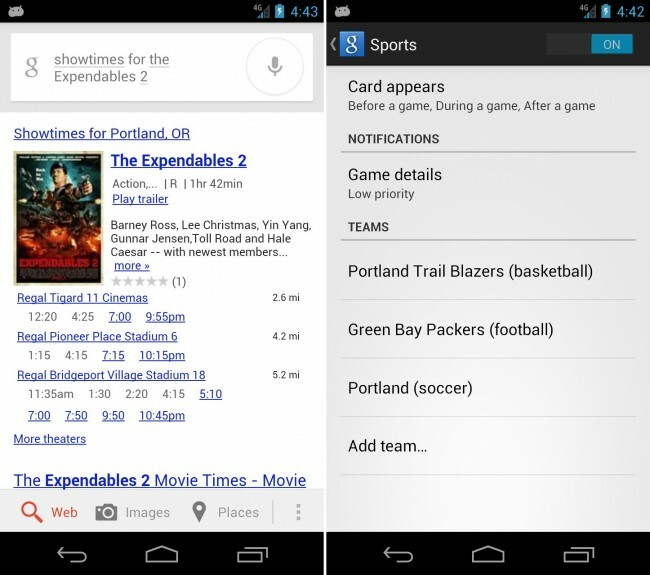 Previously, you had to search for your favorite sports teams and hope that Google Now was smart enough to add them to your feed. They tossed in movie listings, but so far, are not showing up in a beautiful card and essentially look like what you would get with an iOS Google Search. Also found in the update are Public Alerts – examples given are earthquakes and storm warnings. Go grab the newest update and let us know if you’re still loving Google Now. To enable these new options, open Google Now, tap Menu>Settings>Google Now and visit each of the sections. Some of them need to be manually turned on.